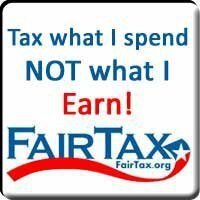 Tax What I Spend… Not What I Earn! Dare Big Gov to be Fair! It’s time to look towards major reform. The question in my mind is why hasn’t Congress and the President embraced The Fair Tax, also known as HR-25, filed in the last several Congressional sessions? This is also legislation the NFIB should support. Here’s how the FairTax would transform our nation. – Federal personal and corporate income taxes, estate taxes, gift taxes, capital gains taxes, the alternative minimum tax, Social Security and Medicare taxes plus self-employment taxes vs a simple, national sales tax on new goods and services (there’s a Fair Tax calculator at the bottom of this post – check it out). One Response to Tax What I Spend… Not What I Earn! Dare Big Gov to be Fair! With upwards to 43% of the American public not paying Federal income tax a Fair Tax makes sense. As the number of federal tax payers continue to reduce, but more and more people become dependent upon the federal government, there are only so many dollars that can be siphoned from the producers in the country. Not only would the 57% of Americans currently paying taxes continue to pay taxes, but you bring into the fold the 43% living off of the 57% of Americans. In addition, you bring in the illegal immigrant population, who contribute nothing to the federal tax rolls at present time. Of course the liberals will whine that it is unfair to the poor and play the class warfare card. However the poor are not going to buy high end items, the wealthy will continue to purchase their toys and guess what? The wealthy would continue to pay taxes as would the rest of the 57% of Americans currently paying taxes. Of course the problem with Washington DC right now is not a revenue problem, it’s a spending problem. Apparently this current administration is in no hurry to cut spending nor do anything about the high cost of energy bleeding Americans dry now. Maybe just maybe a Fair Tax will provide an incentive to our elected officials to be a bit more fiscally responsible.